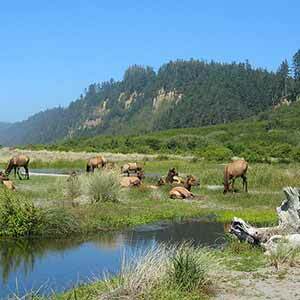 The Mill Creek Trail is best known for being the location of the Grove of Titans. 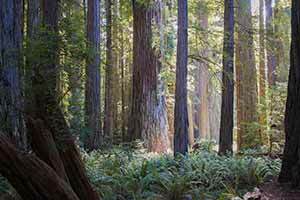 The storied grove, which contains some of the world’s largest measured redwoods by volume, plays a central part in The Wild Trees, Richard Preston’s popular book about big-tree hunters. Although the book made it sound like the grove is in a deep wilderness, in fact it’s plainly visible from the Mill Creek Trail, just a three-quarter mile walk from Howland Hill Road. Despite efforts to keep the grove’s location secret, it’s become one of the park’s most popular destinations. 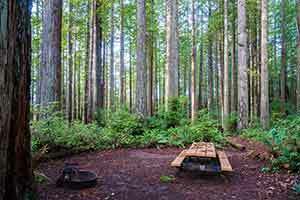 With large numbers of visitors going off-trail to see the biggest trees, the grove is no longer the pristine environment that it was a few years ago. Most people wouldn’t consider lifting the velvet rope at a museum and climbing onto ancient sculptures, but they seem to have no compunction about crashing through the ferns and trampling the vegetation in this ancient grove, even bringing large groups of children and letting them run off-trail unsupervised. 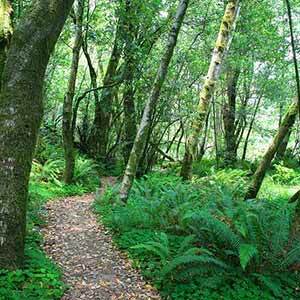 After the Grove of Titans, the Mill Creek Trail meanders for several miles through the sunny, moss-encrusted woodlands above the creek. 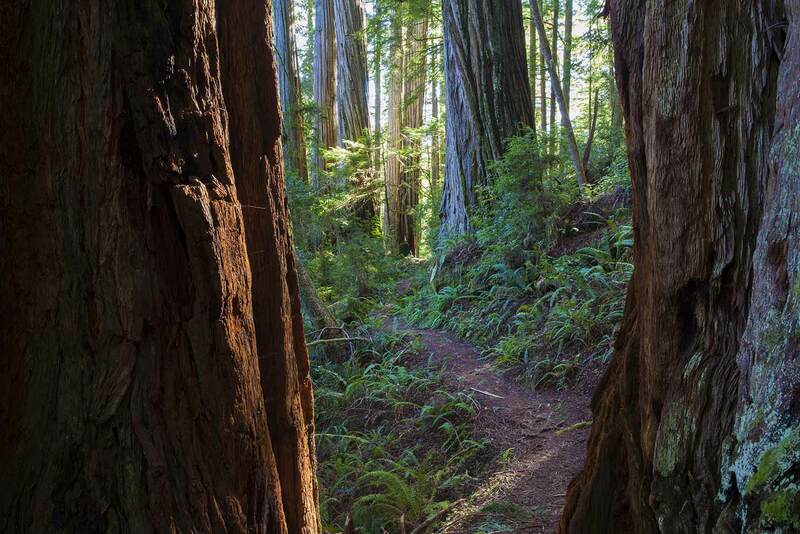 The middle part of the trail isn’t especially impressive, but at the end of the trail, just across Mill Creek from Stout Grove, is a superb redwood grove that makes the trek worthwhile. The trailhead is on Howland Hill Road just south of the big auto bridge over Mill Creek. There are a few small pullouts on the opposite side of the road. 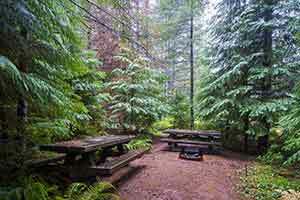 The trailhead is marked with a sign warning Grove of Titans visitors to stay on the trail. 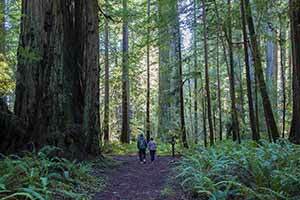 The trail starts in the lowlands and climbs into a dense grove of relatively small redwoods before starting to descend. This part of the trail is heavily-used, so it gets muddy in the winter and the dirt has eroded away, leaving a tangle of exposed tree roots. Starting at the first hairpin turn to the right, a bit of peering through the foliage will reveal some unusually large Grove of Titans outliers, particularly Chesty Puller, one of the grove’s most photographed trees. Every large tree by the trail has an unofficial path leading to it and a sign warning visitors to stay on the official trail. 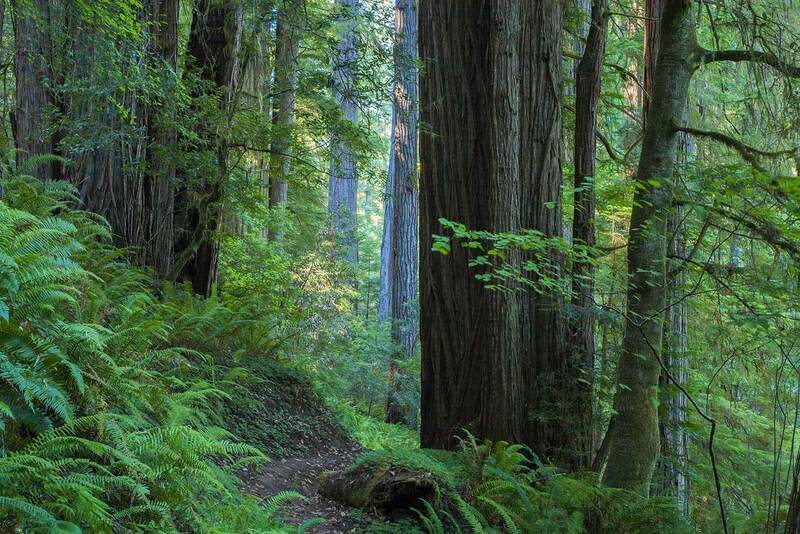 The trail descends into a wide, shallow glen, winds past a large fallen redwood, then skirts around the edge of the Grove of Titans, passing a little marsh that divides the grove. 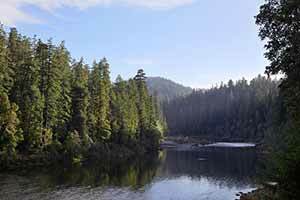 The grove occupies a small alluvial flat where a tributary stream flows into Mill Creek. 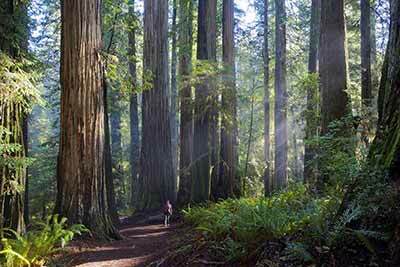 Typically for Jed Smith, the redwoods are huge but widely scattered. 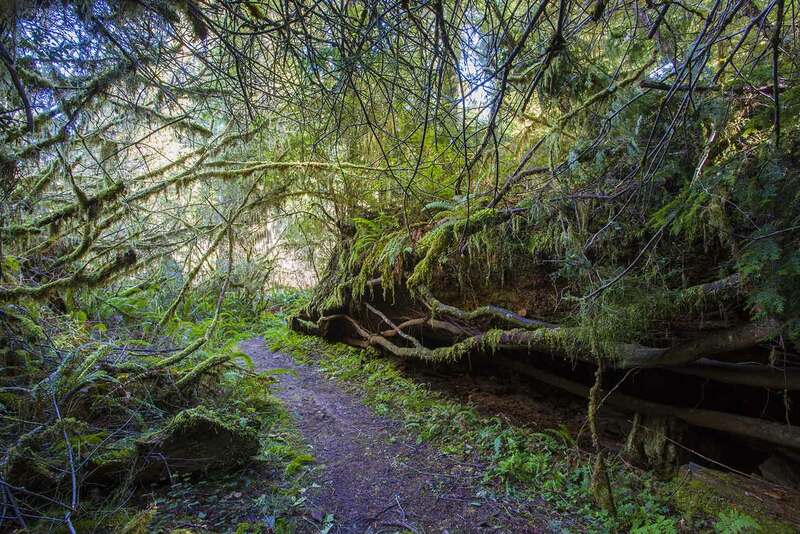 There’s a dense, jungle-like understory, and the biggest trees are a few yards from the trail, so it’s possible to stroll through without noticing anything unusual. However, if you stop and look around for a minute, the grove is a truly magnificent sight. A footbridge across the tributary stream (the first footbridge on the trail) marks the end of the grove. 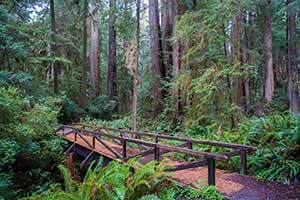 To find the biggest trees, go as far as this bridge, then turn around and go back up the trail a few yards until you see three mammoth redwoods to your right. The furthest, which is also the largest, has an unusual grizzled look and an impressively reiterated trunk; this is El Viejo del Norte, one of the grove’s three titans. A heavily-used unofficial trail, the start of which has been covered with branches and other debris, leads to the tree. 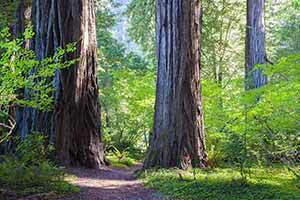 However, the giant redwood is only about 30 yards from the main trail, so it’s not actually necessary to go off-trail to see it. Three other titans are nearby but can’t be seen from the trail. 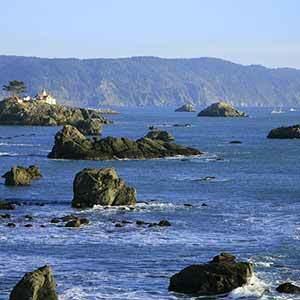 The Lost Monarch is 30 yards to the left of El Viejo, while the Screaming Titans are 50 yards behind it. The Del Norte Titan, which isn’t actually part of the grove, is 100 yards behind you, on a little spit of land across Mill Creek. 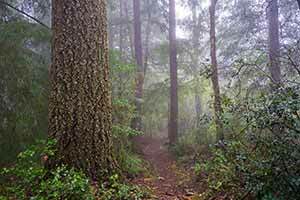 If you do go off-trail to see these trees, at least stick to the established unofficial trails and don’t trample the ferns, sorrel, or mosses. 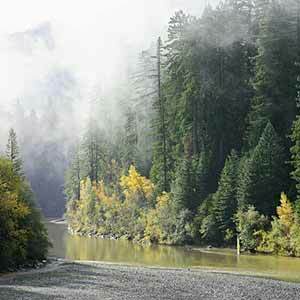 Remember that compacting the soil reduces the amount of water available to the trees and can eventually result in die-off of their tops; such “spike-top” redwoods can be often seen along major roads. 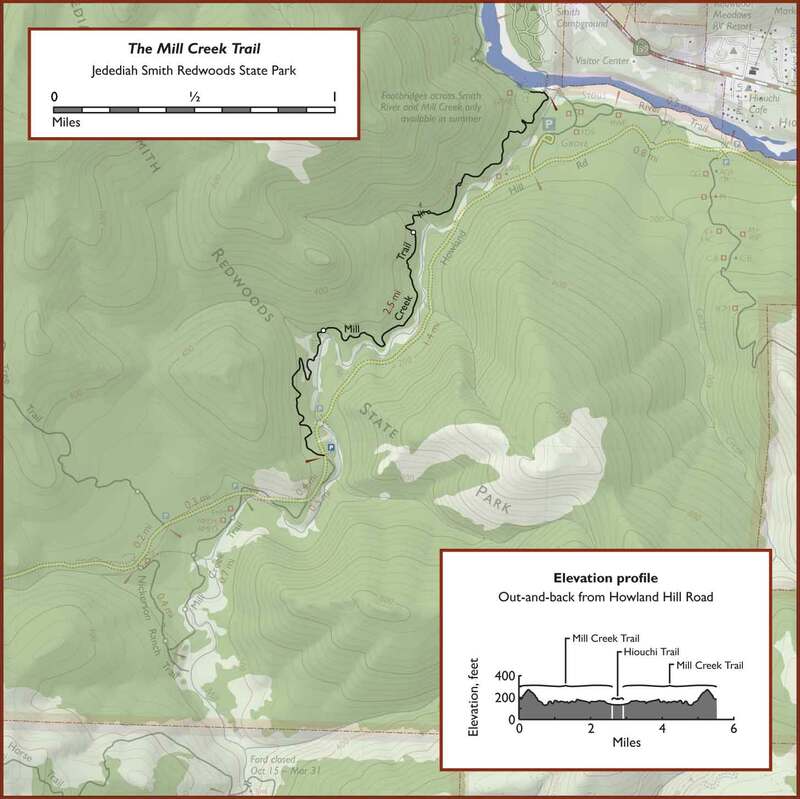 The Mill Creek Trail, which up to this point has been heavily-used, suddenly becomes lightly-used after the Grove of Titans. 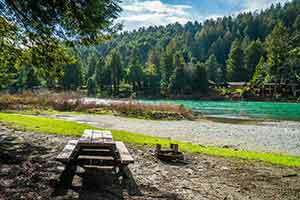 Over the next few miles it crosses several creeks; at each one the trail dives into a redwood grove, some of which have pretty good-sized trees. 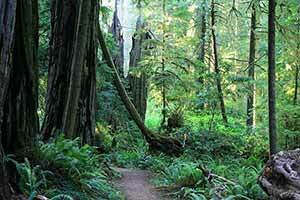 Between creeks the trail runs through mundane streamside vegetation with few redwoods; these parts can get overgrown. The wide, gravel-lined Mill Creek can sometimes be seen below. Across Mill Creek, you may occasionally hear cars grinding along Howland Hill Road. 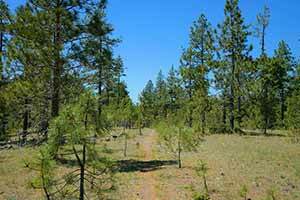 Approaching the wide Smith River, the trail descends into an exceptional alluvial-flat grove. 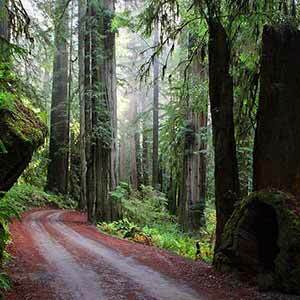 The remarkably scenic grove is unusually bright and open with tall, straight trees and perfectly flat ground carpeted with ferns and sorrel. It’s a little like Stout Grove, but with its own unique character, mainly because a large opening in the middle of the grove admits a lot of light and an understory of small maple trees softens the look of the grove. 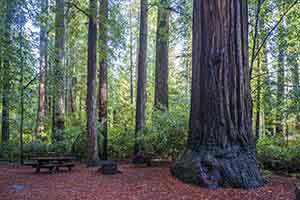 Stout Grove can be seen just across Mill Creek as a huge, dark wall of giant trees, but almost none of Stout Grove’s visitors make it over here, making this smaller grove feel like a quiet, hidden refuge. 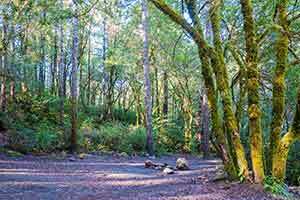 In the summer it’s possible to continue on to Stout Grove; since the grove’s parking lot is often full, hiking there on the Mill Creek Trail is a nice alternative. 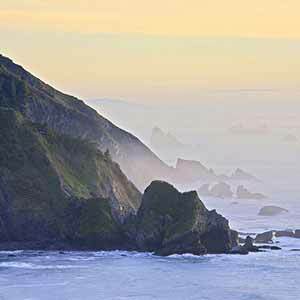 Otherwise, turn around and return the way you came to Howland Hill Road. 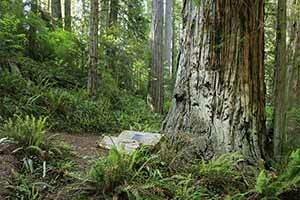 Orion Magazine has a great excerpt from Richard Preston’s book The Wild Trees, about how the Grove of Titans was discovered in Jedediah Smith Redwoods State Park. The Statesman Journal has an article about the effect that Richard Preston’s book had on the Grove of Titans. 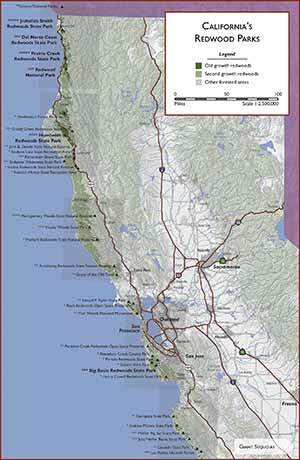 Claudia Voigt’s masters thesis is a detailed investigation of the impacts of off-trail visitors to the Grove of Titans and other redwood groves.